Democratic gubernatorial candidate Stacey Abrams said on Tuesday’s “The View” that she would support a ban on the AR-15 — but she changed the subject when asked whether she would also support confiscation of AR-15s already in circulation in her home state of Georgia. 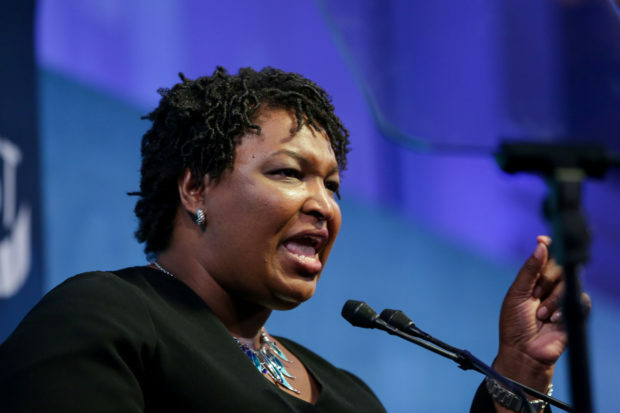 Abrams, who is hoping to become the first black governor of Georgia, appeared on “The View” to discuss her campaign — and host Meghan McCain pressed her on her views regarding the Second Amendment. You have been endorsed by Everytown, an anti-gun organization. Michael Bloomberg’s anti-gun group as well. You say you’re proud to have an ‘F’ rating from the NRA, and Michael Bloomberg and others like him, in the wake of what happened in Pittsburgh, support taking the AR-15, which is the most popular rifle in America, away from people. Do you, like Everytown, support banning the AR-15? Abrams responded by saying first that she was not anti-gun, noting that her grandmother had taught her how to shoot as a young girl in Alabama. I do not believe like weapons of mass destruction like the AR-15 belong in civilian hands. I think it should be prohibited from civilian use. I have shot an AR-15, and I think you probably have too, and while it’s an amazing amount of power, it also is an amazing amount of destruction, and there is very little that can be done to protect vulnerable communities when the AR-15 is present.